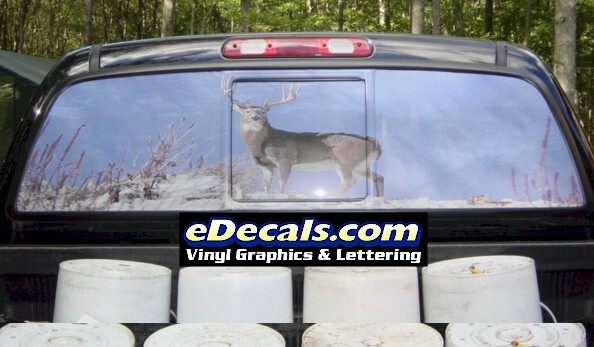 - This product is specifically designed for installation on the outside of the vehicle. - Required Items include an installation squeegee (included), masking tape, glass cleaner, dry paper towels, measuring tape or ruler. - Do not store unapplied graphics in direct sunlight - damage may occur. 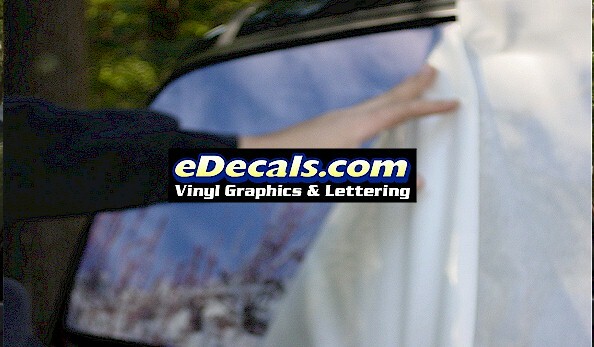 - All dirt, grease and wax must be removed from the car surface before the decal is applied. This includes wax from mechanical car washes, rain-x, compound, etc. Failure to take this step may result in the decal not sticking to the vehicle surface. In some cases the transfer tape covering the decal may become unstuck from the surface of the decal itself. By manually squeegeeing the two together, you will make an easier installation. 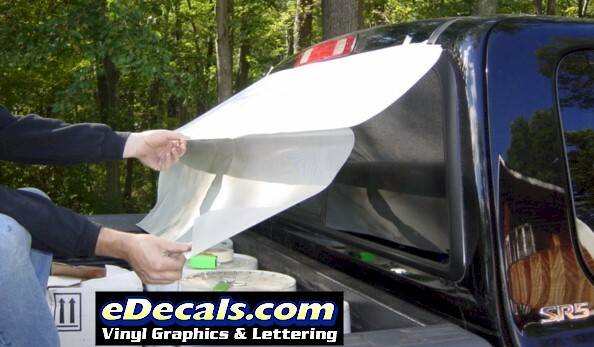 The most important step during decal installation is making sure the installation area is clean and dry. Make sure there is NO WAX, RAIN-X, COMPOUND, lint, dust, or other residue on the surface. Remove all wax, compound residue, car wash protectant, etc with PREP-SOL, laquer thinners, brake cleaner, 409, Fantastic, etc. After cleaning the surface, go over the surface with regular glass cleaner. Wipe it dry. All waxes, oils, and polish must be removed from the vehicle surface to insure that the decal will stick properly Make sure the area is at least 60° F and no hotter than 80° F.
LARGER VIEW Apply a long piece of masking tape along the top of the decal with approx half of the tape on the decal and half on the vehicle surface. This will make a large hinged 'flap'. 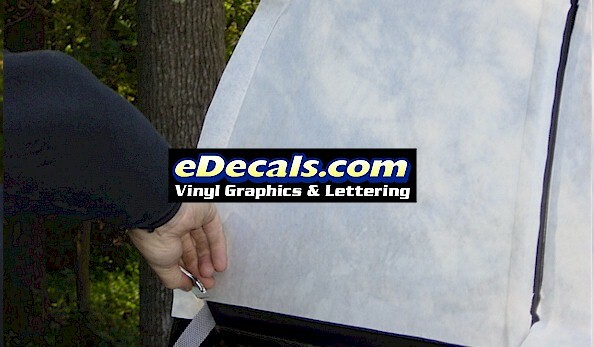 Then carefully trim around the edge of the decal with a scissor or razor blade. Be sure to allow at least 1 inch extra all around. The hinged flap will make installation much easier. Raising the large hinged 'flap', and begin to peel the wax paper backing off the decal (exposing the sticky side of the decal). Be sure to only expose half of the decal. DO NOT ALLOW THE STICKY PART OF THE DECAL TO TOUCH THE VEHICLE SURFACE. 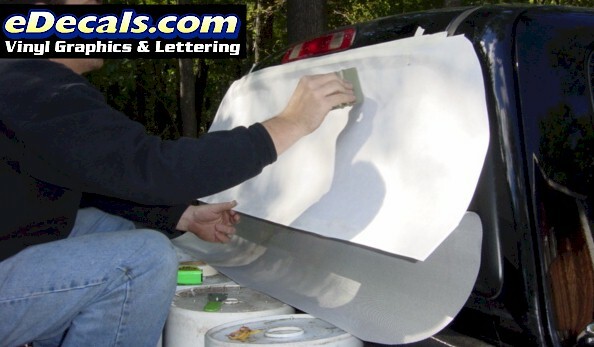 Peeling the backing paper only half way down will allow you to keep the decal away from the vehicle surface until necessary. 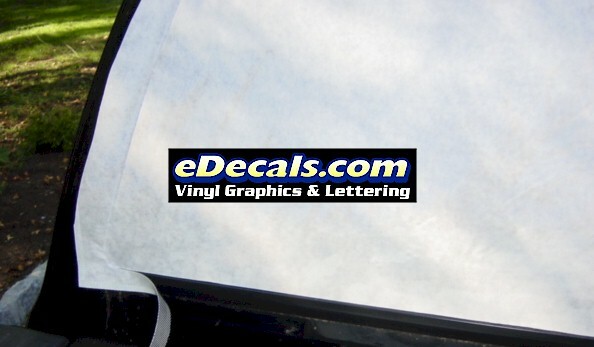 LARGER VIEW With the wax paper backing peeled half way downward, begin to apply the sticky side of the decal to the vehicle surface with the Free application tool enclosed. Besure to use even strokes horizontally across the decal. ONLY APPLY THE FIRST HALF OF THE DECAL. Continue smoothing out the decal with long hoizontal strokes, starting at the top and working towards the bottom. Continue to remove the backing paper as needed. 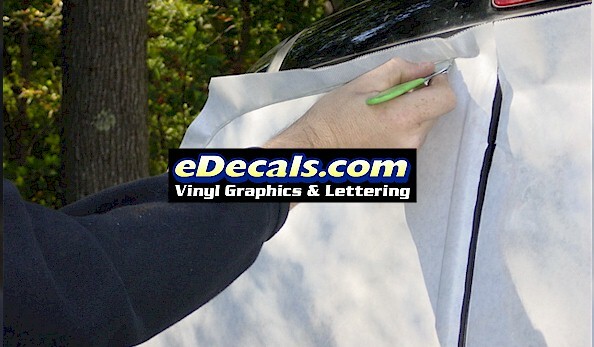 Once the entire sticky side of the decal is applied to the vehicle, go over the decal with the application squeegee, with increasingly harder strokes. Using a sharp razor blade, carefully cut around the edge of the window trim, just on the glass. For sliding rear windows as shown in the example, cut vertically along the slider trim, slicing apart the window sections. Fold over the decal and use the squeegee to work the decal into the recesses. LARGER VIEW Once the entire sticky side of the decal is applied to the vehicle, go over the decal with the application squeegee, with increasingly harder strokes. Then begin peeling the transfer tape covering the decal. LARGER VIEW Finish removing the transfer tape covering, peeling from one side to the other. Any small bubbles can be removed using a small razor blade. Take the razor blade and poke a small hole in the vinyl at the source of teh bubble. Then with the squeegee, push the remaining air out of the bubble. Be sure to follow the care & maintenance instructions below. PLEASE NOTE: These full color decals are made using a printing process where solvent ink is fused to standard self adhesive vinyl material. This process allows the ink to remain on the vinyl material for up to 3 years without fading or cracking. You must be careful not to use harsh chemicals on the full color decals. This will damage the decals. 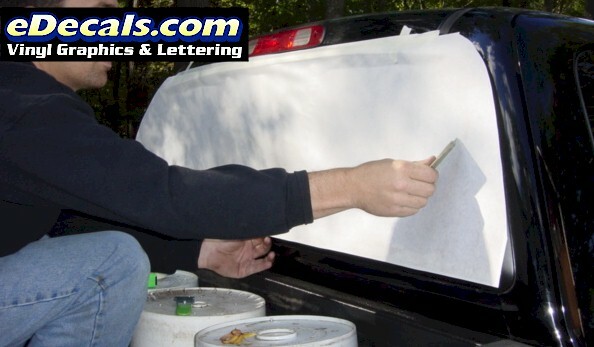 We recommend you wax over the decals after installation using a non solvent paste wax. DO NOT USE LAQUER THINNERS, 409, FANTASTIC, SUPER CLEAN OR OTHER HARSH CHEMICALS TO CLEAN THE GRAPHICS. DAMAGE MAY OCCUR. This page is protected by U.S. and International Copyrights. Any duplication or distribution of this information in any form is illegal. We have successfully prosecuted content theft in the past and aggressively pursue violators. The information has been imbedded with searchable phrases which can be traced to any website using them.